I had a Ladies Luncheon with two girlfriends and I wanted to make something that looks fancy but was easy, and also tasted delicious. 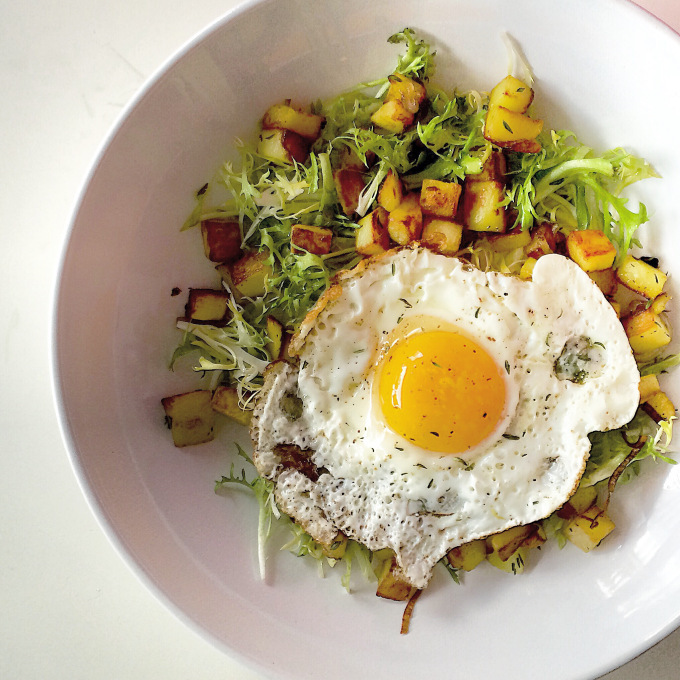 This dish is so pretty and looks like something you would order for brunch at a french bistro. If you want to impress someone, this dish will do it. In a large bowl, mix vinegar, Dijon, garlic, and salt with a whisk. Slowly drizzle in the olive oil while whisking vigorously. Cut the frisée where the green part starts to turn white. Add the dressing and toss making sure all leaves are lightly coated. Set aside. In a large fry pan over medium-high heat, melt the butter with the olive oil. Add the potatoes and thyme, and season with salt and pepper. Let potatoes fry, stirring often until they are browned, about 15 minutes. Add the shallots and cook until shallots are fried and potatoes are fork-tender, about 5 minutes. Using the same frying pan for the potatoes, set over medium heat, add olive oil. Crack the eggs into the pan and fry to your preference. I like the whites fully cooked with a soft runny yolk, so I cook mine for about 4 minutes. Put the salad onto the plates, spoon the warm potatoes over the salad. Top with the fried eggs and sprinkle a little salt and pepper and thyme. The dressing is sharp and is really good for warm salads. I make a batch of it and keep in the fridge. I’ll make about 2 cups worth and instead of chopping and whisking, I throw everything into my Nutribullet and blitz. If you can’t find frisée lettuce, you can use escarole or even arugula. You want a lettuce that can stand up to the heat of the potatoes and egg and carry the dressing. I used champagne vinegar to make it special. But white wine vinegar is a fine substitute.